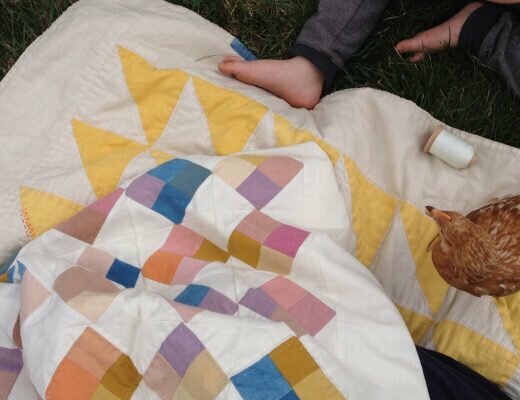 simple matters 09: sarah waldman – Reading My Tea Leaves – Slow, simple, sustainable living. 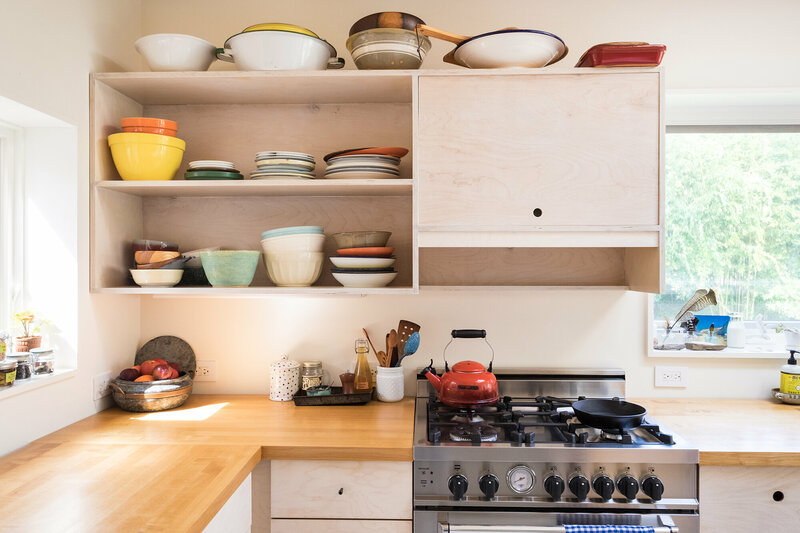 Sarah Waldman is a food writer and recipe developer who lives on the New England island of Martha’s Vineyard with her husband and two children. 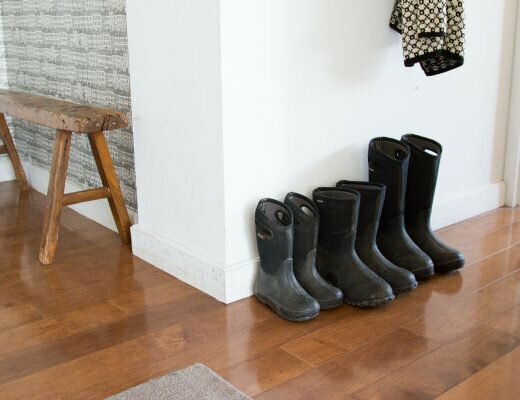 She shares her thoughts on how island life forced her family to simplify their lives, on working from home, and on how food and feeding a family enters the conversation about simple living. Erin: Let’s start by having you tell RMTL readers a little about yourself and your work. 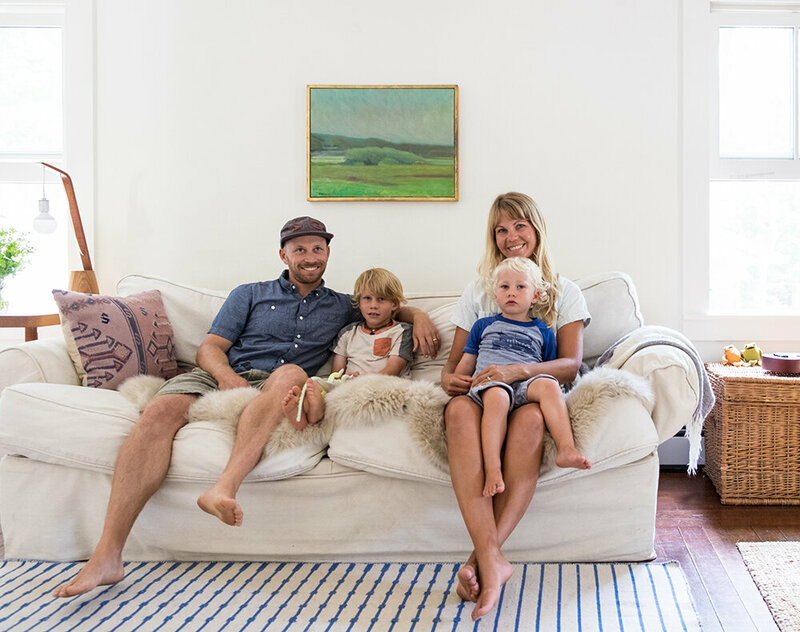 Sarah: About three years ago my husband Nick and I decided to take the plunge and move full-time to the island of Martha’s Vineyard. We were familiar with the island before moving—I was a summer kid here (my grandparents and parents both lived here part-time), Nick and I got married here, and we visited all throughout the year, but committing to island living felt more serious. Moving to a small island automatically forced us to simplify our lives. We adapted quickly to life here which is strongly based in tight community connections, nature, and adventure. Of course there are times when I get annoyed with having to take the ferry and wish for a big box store down the road (there are no chain stores on Martha’s Vineyard) but in general the lifestyle, community, and natural beauty is hard to beat. I work as a food writer, recipe developer, and am finishing up a cookbook. My book, Feeding a Family: A Real-Life Plan for Making Dinner Work comes out in April. I have been working on the book for two years and I can’t wait to share it. When I’m not at my stove or kitchen table working on the book, I am writing articles (see my Food52 stories, here), testing recipes for publications, and helping island friends with food-related projects. The core of my work is helping families find recipes, methods, and planning strategies that encourages whole food cooking at home. I also write a lot about feeding babies, picky eaters, and kids in general. In my “free time” I help run Vineyard Birth Collective which provides a listing of local resources and practitioners offering physical, emotional, and social support to Island families during pregnancy, childbirth, and the postpartum period. I also manage a killer cookbook club. My husband Nick is a designer who works in an architectural office three days a week and from home on his own design projects two days a week. We have two little boys. Dylan is 6 and is obsessed with butterflies and hockey and Gray is 3 and is obsessed with Babar and motorcycles. 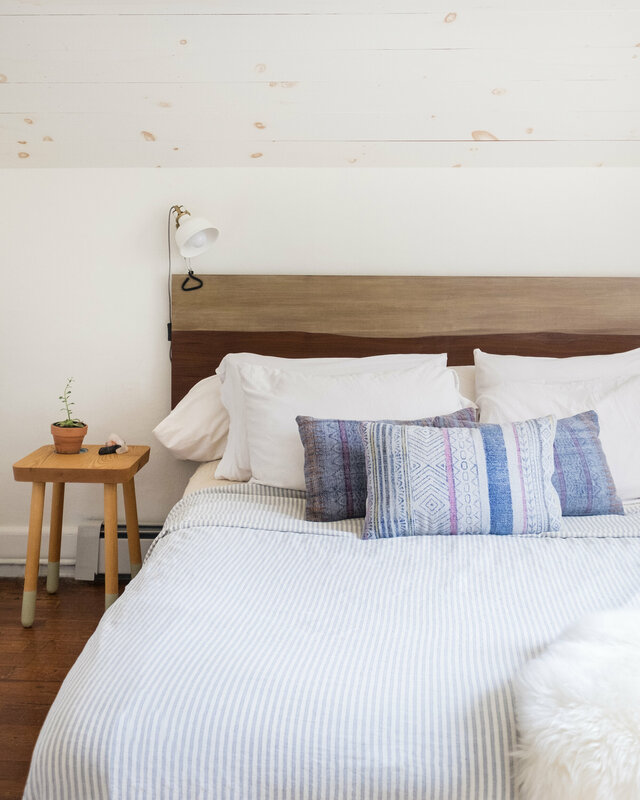 Erin: In 2012 you bought what you describe as a rundown 1924 cottage on the island of Martha’s Vineyard and began renovations with your husband. What was your house like before you began to renovate it? What was the most daunting aspect of the project? What was the most exciting? Sarah: When we bought our house it had been a rental unit for many years so the basic upkeep and love was not there. The kitchen was a tiny galley with countertops that went halfway up the windows—it was really junky. The yard was a mess with overgrown vines and a huge muddy driveway. Luckily, Nick and I immediately saw charm under the artificial ceiling panels and yellow walls, and knew what this little cottage could be. It was the right size, had nice proportions, a manageable level of renovations, a good location, and was affordable. 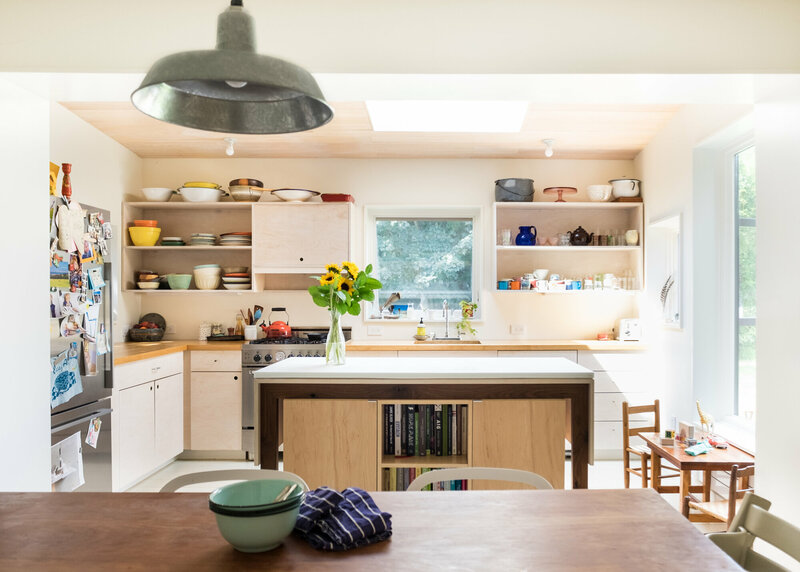 The most daunting aspect was realizing, soon after the closing, that a kitchen renovation wasn’t going to cut it—we had to build an addition. 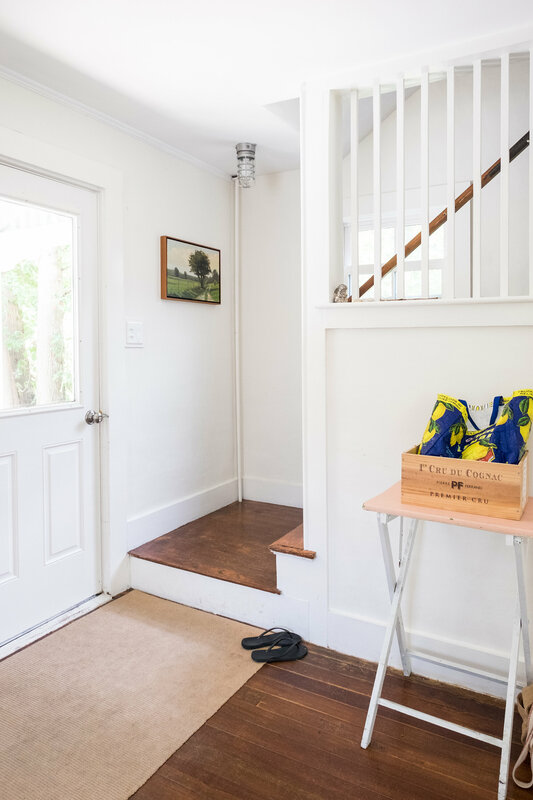 New construction was not in our original budget but we knew it was a smart investment for the house and our family so we made it work by doing all the work ourselves (the only tasks we hired out were plumbing and plaster). It was also daunting to manage our family time and emotions during such an overwhelming period. Our second baby was due six months after we closed so his arrival was the deadline for all the construction and moving tasks. It definitely felt overwhelming! The most exciting part was feeling so lucky to have found a house on Martha’s Vineyard that worked for us. The market is crazy and I honestly never knew if we could swing it long-term but the stars aligned. It turned out the seller was the woman who officiated our wedding. It also felt great to see Nick’s time, energy, and talent directed to our house and not a client’s house. I’m a professional nester, especially while pregnant, so being able to dream about, organize, and design our space during those last few months were very theraputic for me. Watching Dylan run around the empty house exploring his new room and “helping” Nick and my dad with projects really made it feel like ours long before moving in. Erin: I’ve found that folks who live on islands often have an acute understanding of the impact of their choices on their surrounding environment. Did island living influence your design choices or use of certain materials? Were there local restrictions on building that affected the project? Sarah: Living on an island definitely makes us understand the impact of our choices on the surrounding environment. First of all, building materials are really expensive here because everything has to be transported via boat. It’s crazy to think about the fuel and energy used to haul materials everyday. The cost of goods and the knowledge of what it takes to get stuff here has pushed us even further to do things ourselves and salvage materials from our house to be used again in future projects. The living room bookshelves, our headboard, and computer desk were all made from “extras”. 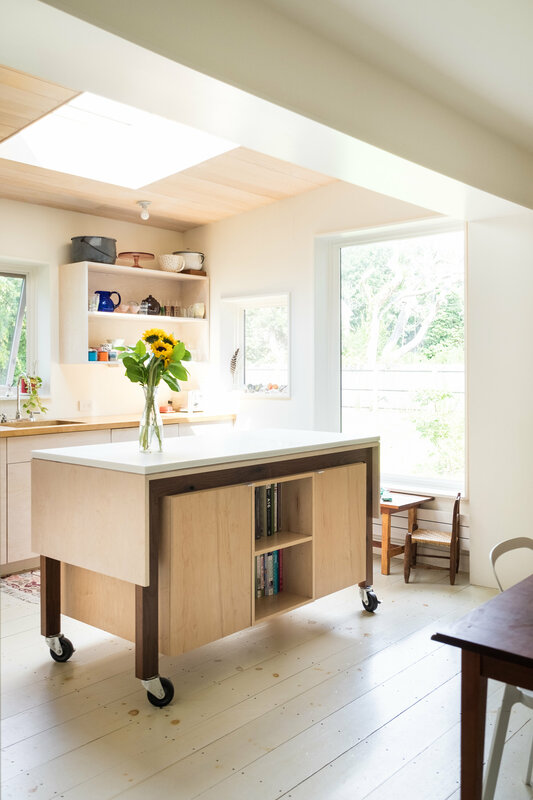 We did go off-island to build substantial pieces of the kitchen like the cabinet boxes, kitchen island, and countertops. Often, we’d ask contractor friends to bring loads of things for us when they traveled back and forth for their own work. Martha’s Vineyard has many expansive and expensive seasonal homes. Often, these homes are renovated and perfectly good materials are discarded. Nick has salvaged some materials from construction projects to recycle at our house. There are also no traditional furniture or homeware shops on the island so we look to local yard sales and to the thrift store for good finds. Close to 75% of the pieces in our home are recycled or homemade. 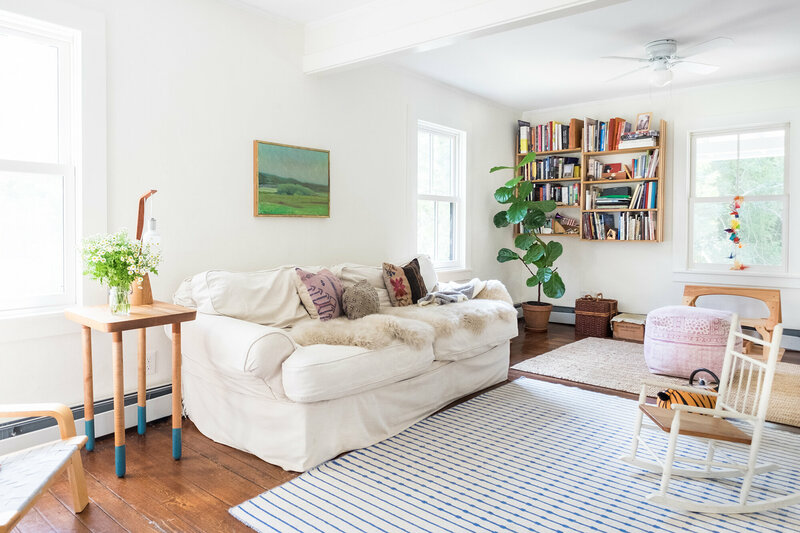 Erin: Photographs of your home show a space that looks bright and airy, but still full of color. How would you describe your approach to decorating a space around the needs of a growing family? Sarah: I like to think of our house as a white box that we fill with things we make or find that we like. “We” here includes the boys who naturally gravitate towards happy, colorful things. Dylan chose everything that is in his room. Our house is not huge so I am really picky about what comes in and stays. There is no play room so we have to live with all the toys and “stuff” which is sometimes annoying but also makes us careful in our choices. When our oldest son was a baby our apartment was covered in toys. I didn’t realize it at the time but it really drained me and made me feel like my life was 24/7 kid-swamped. In reality, my life now is still 24/7 kid-swamped but there are many spots in our home that feel controlled, relaxed, and grownup. There are no spaces in our house that are “off-limits” to play on, jump off of, or ruffle up. Because of this, I buy less expensive Ikea rugs (knowing they’re going to get crumbs smashed into them pretty quick) and our sofa is about 20 years old, taken from my parents house. I had big dreams of buying a gray linen upholstered sofa when we moved in but knew this is not the phase of our lives to have it. Someday! Storage with two small kids is key. For us, storage works best in wooden wine boxes (ask a favorite liquor store for some), baskets, and chests. 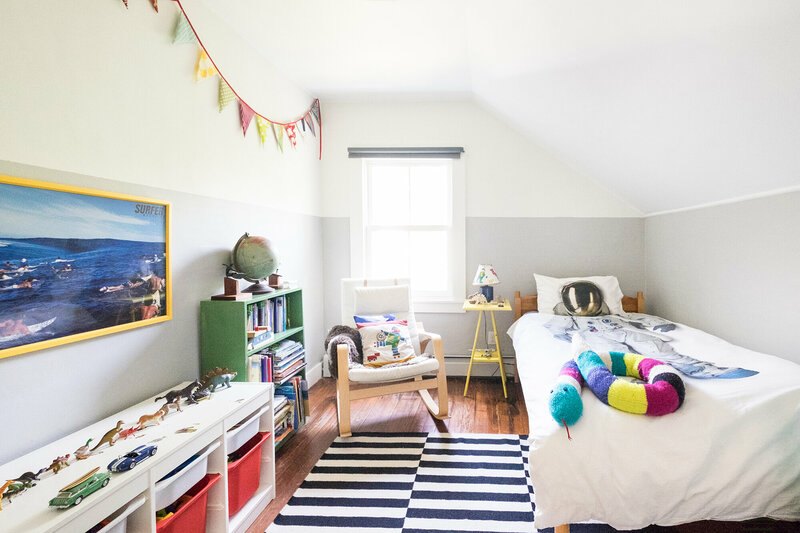 We also use the space under the boys’ beds to hide a lot of stuff (like stuffed animals and blankets) rather than packing our closets to the max. There is something about an overflowing closet that makes me anxious! Nick and I didn’t want any colored walls but thought a couple of special details would make the boys’ rooms fun. 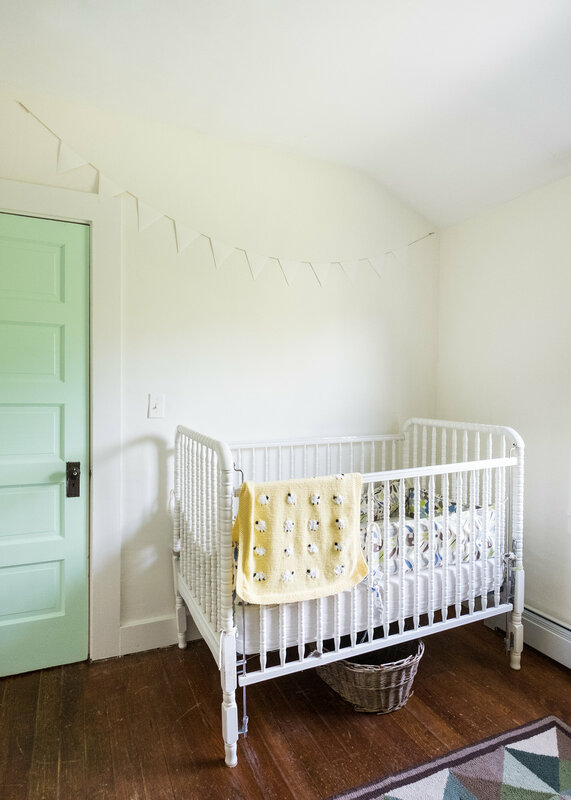 The gray strip in Dylan’s room feels timeless and the pop of minty green in Gray’s nursery fulfilled my nesting dreams. The green is just on the doors so if that room changes use or Gray outgrows the color we can simply paint over it. We have tried to keep the three bedrooms fairly neutral knowing that they may change uses as the boys grow up and perhaps share Dylan’s room or take over our room. Nick always reminds us to invest in what we use and touch everyday like the cooking range, faucets, and windows. 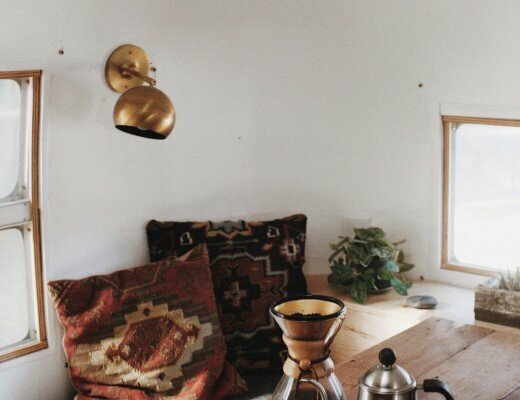 Above all else, we want our home to feel like us and reflect the place we live. This means a lot of homemade, personal finds and hints of the ocean. Erin: You’ve written that the kitchen in your home was a romantic gesture from your husband—a kind of gift to you for your work in food. As a recipe developer and food writer, does that mean that a lot of your work gets done from home? What does your home office look like? What’s your take on striking a work-life balance? Sarah: My home office is our kitchen and the dining room table. This is where I work developing and testing recipes and writing. My friend Elizabeth Cecil shot most of Feeding a Family in this space. 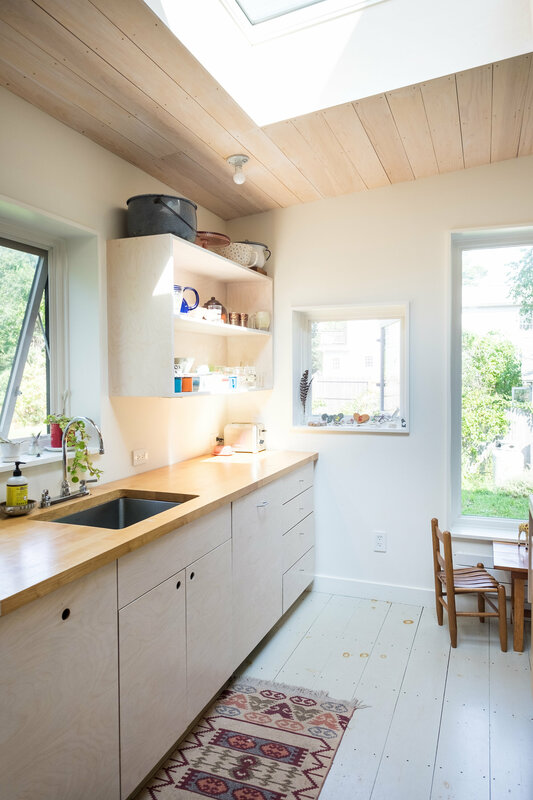 The big window and skylight, bright walls and ceiling give the kitchen loads of natural light, even on cloudy days. This summer I started to really miss working with other people in a social, collaborative setting, something I hadn’t done since having kids. So much of my work is personal, individual, and sometimes isolating. I realized after six years of being hard focused on my little kids and working alone that I needed to talk to other adults! Happily, this September both boys started school (Dylan is in kindergarden and Gray is in preschool 4 days a week). Now I have four school days a week to work on my own projects and outside of the house. One day a week I help my friends develop their superfood chocolate cookbook and another day I help a friend promote her beautiful island flower shop. I am really grateful that I now spend two days a week helping girlfriends, who I really admire, on their projects. The rest of the time I’m at home cooking and writing. I don’t think there is such a thing as work-life balance in real time. I hope to look back on my life and feel, as a whole, there was a work-life balance over the decades but day to day a piece is always going to feel out of balance, especially with the unrealistic roles and responsibilities put on mothers. This is the first time in 6 years that I’m not working with a kid at home. In the past, I would work during the day wearing Gray in a carrier while I cooked and writing at naptime or at night. I am a horrible night worker and after five years of that arrangement I knew something had to change. Luckily, right when my burnout hit full force, our kids started school. Now I drop my kids off at school, work, pick them up at 2:40 and we get to be together every afternoon. Gray is also home with me on Fridays so I can continue my 7-year Music Together streak. Erin: How do you think food enters the conversation about living simply? You have a new cookbook coming out in April called Feeding a Family, can you give us a peek into the philosophy behind the book? What kind of advice would you give to parents of small children hoping to simplify meal times? Sarah: Feeding your kids is such a personal, sensitive job. It can be both exciting and completely overwhelming. I totally get that we are busy and it is hard to make time for shopping, planning, and cooking food at home. But, I think we NEED to make feeding ourselves a priority. How many hours a week does your family spend on extracurricular activities in compared to cooking and eating together? Is it out of whack? In Feeding A Family I go into depth about the benefits of family dinner, family nutrition, planning, shopping and preparation, involving the whole family, feeding “picky eaters”, including a baby at the table, and building a family pantry. The book also included 40 dinners, more than 100 recipes, of our family favorites. My suggestion to busy parents is to do a case study of your family and see what is working and what isn’t working. Then, call a family meeting and talk about things that are changing. Make it serious and get everyone involved. If there is one person (ahem…mom) in charge of planning, shopping, preparing, managing, and cleaning up all family meals that person is going to get burnt out and resentful pretty quickly. I think we need to change the pressure society/social media puts on parents and mothers in particular. Nobody’s kid eats perfectly all the time and nobody makes a three course meal every night. I encourage parents to look at their child’s diet over the week, month, or even the season to get a real sense of it. And while we’re at it, let’s rethink what dinner is. Dinner can be any simply prepared home cooked meal from egg sandwiches, rice and beans, turkey sandwiches, to pesto pasta. It doesn’t have to be Instagram-worthy or include fancy ingredients. To me, building a diet of whole foods, cooking for yourself, inviting family members into the process, and building a simple family pantry to pull from are keys to successful meal times. My advice is to ease up on expectations, call a family meeting, plan ahead, serve food, eat food, and stick with your plan. To learn more about Sarah and her work, head to her website. 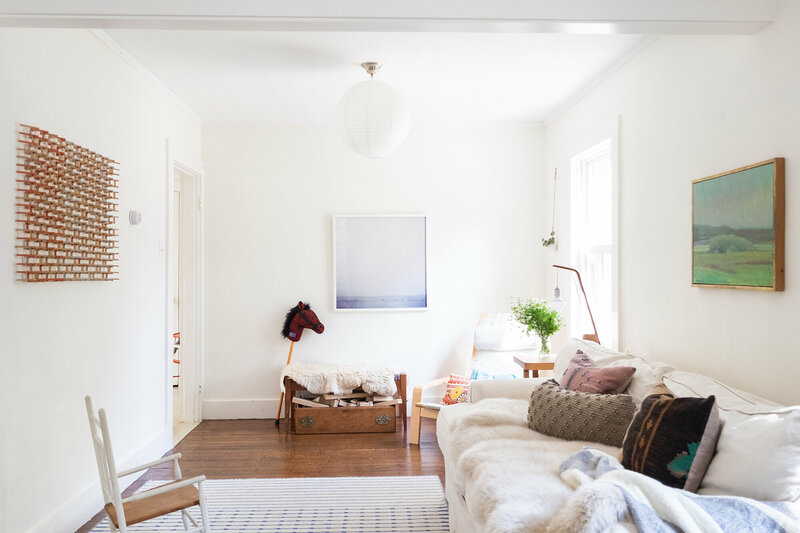 Photos of Sarah’s house and family by Emily Billings for Apartment Therapy. simple matters 02: kate oliver. Hi, you have a beautiful home! Can you tell me more about your kitchen floors? What’s the finish? Do they stay reasonably clean even though they are white? Surprisingly, they do stay reasonably clean! I love the way they look and work. 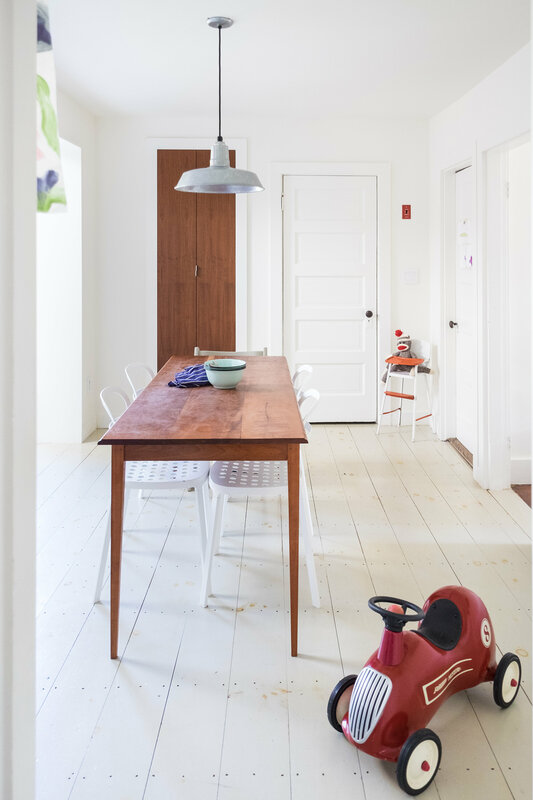 The floors are knotty pine boards with three coats of grey paint and a coat of polyurethane. It’s not too late Jill 🙂 Do you visit!? I haven’t yet, but it’s on my bucket list. My fear is I’d visit and never leave. 🙂 Somehow when I look at pictures of the island and read about it, it just sounds like me. First of all, I just LOVE love love LOVE this series. As soon as I see you have added the next instalment I have to calm myself, make a cup of tea (I have to make a celebration out of the reading) and sit down knowing I am in for a grand adventure. This interview with Sarah is great – what a fascinating life, what a fascinating take on food and feeding a family. I loved the idea of standing back and thinking about your child’s diet across a season to know what is really going on. Thank you Kirstin – I agree with you, the simple matters series is so great! Thanks for taking the time to learn about my work. Thank you for the reminder that my little ones will be in school some day. I truly forget! It helps me savour them/tone down my daily expectations. 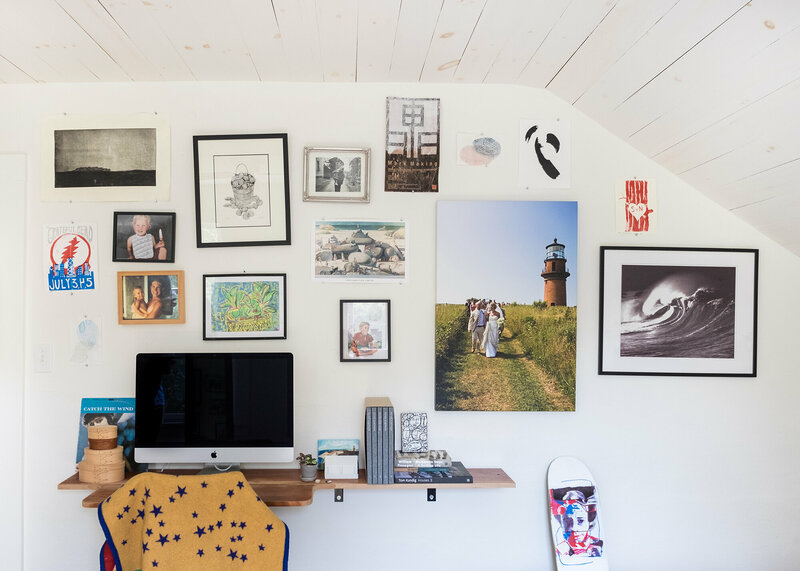 We’ve recently moved into a 1929 cottage fixer-upper and I’m a freelancer. Everyday I hope for 30-60 minutes of overlapping naps (3 mo, 2.5 y) but it’s usually 2-15 minutes. Work will resume and those magical little years will be gone. I’m hoping to line some of our ceilings with panelling because they are popcorn-sprayed plaster (and I’m looking for a quicker fix). May I ask what you have in your kitchen and bedroom? It looks wonderful! Wonderfu articlel! My husband and I are moving back there next year (he grew up there but lived with me in Chicago for 5 years or so 🙂 and I’m so excited!! Seeing a young family make it happen gives me hope that hopefully we (late 20’s) can one day own a home on island!